“Hey…how’d you make that so fast?” a voice asked from over my shoulder. “No, like the whole thing. The graphics, the camera movements, …” I sensed confusing under his breath. “OMG MAGIC THAT’S THE COOLEST THING EVER!” Okay, he didn’t actually say that but his jaw just about hit the ground. He had never heard of an After Effects template. If you’ve been reading lately then you know I’m trying to run with this theme of “you don’t know what you don’t know”. Let’s file this post under that theme. There is no dumb question and if you’re an “advanced editor” reading a post that’s designed for new editors feel free to stop reading here and go yell about LUTs or something on Reddit. In this post I’m going to explain what an After Effects template is, some of their benefits, some of their downsides and where you can get them. An After Effects template is a pre-built After Effects project (.aep) that is made in a way so you can pop in your assets (i.e. footage, logo, headshots, etc.) and create a video in record speed. 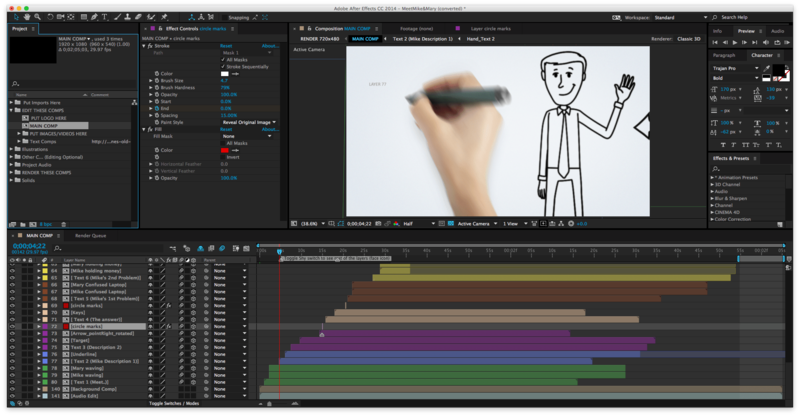 After Effects templates can be entire explainer videos, typography videos, logo opens, title packages, green screen virtual sets, infographics, etc. etc. And I’ve used just about all of them. For example, let’s take a look at this After Effects template. And now let’s take a look at what I made it into. To get an After Effects template go to one of the sites I’ll list below, pick one out, purchase it, download it, watch/read the tutorial, open up the .aep, and get to work. There are usually a handful of places to check out when you first jump into a project like compositions titled “CHANGE LOGO HERE” or “INSERT COMP1 FOOTAGE HERE”. Also look for layers titled, “CHANGE COLORS HERE” and typically you select the layer and there are parameters you can adjust in the Effects Controls Panel. It kind of goes without saying but you need a license of Adobe After Effects in order to use an After Effects template. Most templates are backwards compatible for a few versions. If you have any CC version than you are most likely fine. It should say somewhere on the website what minimum version of AE you need though. How I work is once I open up the .aep I find the MASTER comp or the RENDER ME comp (it’s typically labeled something like that) then work my way backwards through the precomps to see how everything works together. Then I get to work. This is a basic example of what one of the comps *could* look like. Daunting, huh? This is an example of what the Project Panel could look like. Fairly self-explanatory? Let’s bullet point this out. They save you time. A lot of time usually. This is by far their biggest selling point. I’ll ballpark it that 30-50% of a project can be completed right off the bat just by using one. They give you boundaries to work in. I was using the AE template in the little story in the intro to this post because I needed a starting point for this project. I literally had free rein to do anything I wanted which is great until you find yourself with no place to start. So I picked this AE template in order to have some basic constraints for the project, which got the ball rolling. You learn how others use After Effects. 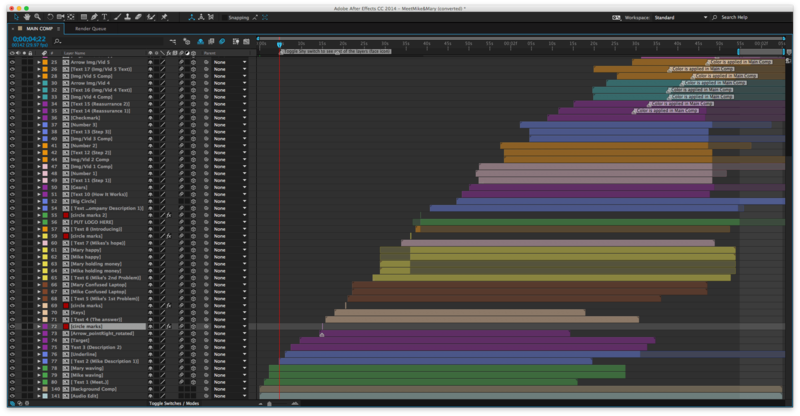 AE is incredibly deep and editors can do one thing a dozen different ways. You will generally always learn a new tip or trick or just go, “oh, so they did it like that?” at least once. 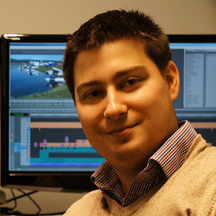 A lot of us don’t get to work with other editors and seeing another editor’s project is rare. This gives you a glimpse into how others work. 30-50% of a project can be completed right off the bat just by using one. They give you boundaries to work in. Yes, I know I just listed this as a benefit. The boundaries are great sometimes but will give you massive headaches other times because they aren’t always easy to modify. Quick example… Let’s say you want to change the length of a precomp. Cool. You go into the Composition Settings (Cmd/Ctrl+K), change the time then extend all the layers. Oh wait. They used a 10-second .mov for one of the background elements and it doesn’t loop and when you change the speed it looks weird… See where I’m getting at? Also, having a picky client can be tricky. Oh, they want all the squares made into circles? Yeah…that’s probably not going to happen. 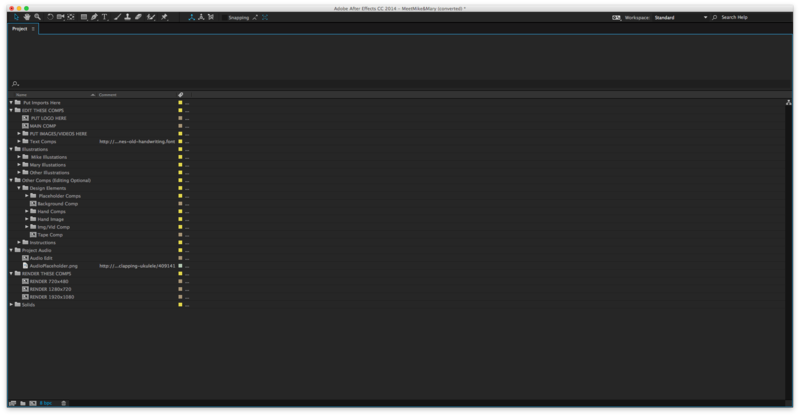 You don’t truly know how easy it will be to manipulate an AE template until you buy it. This is piggybacking on my last point. Make sure to read the reviews if available. A lot of them are really easy to use. However I’ve found that you can also get some lemons every once in awhile. Cost. Yes, they most of the time they cost real cash. Expect to spend $15-$45. Tutorials are typically lacking in substance and quality. About half the time you’ll get a video that will [sloppily] walk you through how to change different elements (colors, insert logos, etc.). The other half of the time you’ll probably have a .pdf that probably isn’t worth reading IMO. Jump in and dig around to figure stuff out. The music generally does not come packaged with the AE template. Most of the time when you watch the preview there’s this nice song or sound effects that go along with it. Yeah, these aren’t included. Most of the time they are linked on the website where you buy the AE template. FWIW I get most of my music through Soundstripe (affiliate link) (p.s. You can use the coupon code EVF for 10% off 😉). If you have other places you like to get After Effects templates leave them in the comments! An After Effects template is a wonderful tool you can use to spark creativity, give you a jumpstart on a project and teach you new things about such an in-depth software. However they cost money and can occasionally be difficult to adjust to your needs. I recommend trying one out if you haven’t before. Occasionally the sites listed above will have massive sales or do something like give away a free AE template of the month. Take advantage of those if you have a chance. I hope you found this article helpful. I have a ton of posts and tutorials coming up in the queue once I can get a couple more freelance projects off my back. If you’re new around here and want to stay up-to-date with the latest on EVF go here and you’ll never miss out on posts like this one. Great write-up by the way!